We can supply a range of bathroom suites and showers - though they're for local delivery and callers only as they are too big for the post office ! Shower upstand seal (2 metre length). Sealux AquaStrap is a leading up-stand seal used for sealing a shower tray/pan or bath tub. Shower upstand seal (3.2 metre length). Pair of M8 x 110mm wash hand basin anchors. With nuts and plastic wall plugs. This is the piece that makes the joint / swivel link between the two rods on a pop-up plug bathroom wash hand basin waste. For callers and local delivery only - too heavy to post . 5 Piece cloakroom suite. 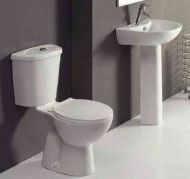 Includes basin, pedestal, toilet pan, cistern and seat. Push button dual flush cistern. Taps extra. For callers and local delivery only - too heavy to post . Close couple toilet. Includes pan, cistern and seat. Push button dual flush cistern (complete with ready assembled flush valve and float valve). Horizontal waste outlet - not visible in picture. 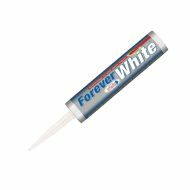 Forever white shower and bathroom sealant. Won't blacken, stain or yellow. Stops mould growth and fungi. Gives a lifetime guaranteed seal - always looks like new. Comes with applicator nozzle. Use with standard silicon gun (not included). The shower PL8 can be fitted into any kind of wall, block or brick, stud partition or rendered wall and creates a perfect fix every time. Bolts and plugs for mounting sanitary ware. Double function head with slotted and hex drive. 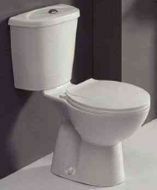 2 part screw head cover makes this an ideal item for fixing toilet pans to the floor.